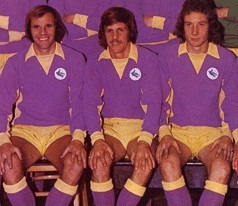 The player pictured in the foreground of this odd photo which shows four men all wearing different kits (!) went backwards to go forward in his Burnley career. Starting off at the Turf Moor club, he established himself in the first team over the second half of the 60’s after something of a false start. A new decade brought a new opportunity as he moved on to the site of a ship that enjoyed its greatest moment over a century and a half earlier, but a desire to return home saw him leave after a couple of years for a ground which is not the celebration of acne that first impressions may suggest it is. His final three teams are all either former Football League clubs or they have returned to the competition after a spell out of it. Two of them are on the same side of the country and have the colours white and black featuring prominently in their kits, while the other, the team he finished his career with, were always regarded as something of an outpost on the other side of England – his one season with them turned out to be their last in the Football League as they played their last match in the competition in South Wales, but can you name the player? 70s. Mixed up head of television went on hike and ended up with someone who arrived at Burnley via their great rivals and a bunch of confectioners, with a short stop off in Mexico along the way. 80s. The word “perseverance” probably best sums up the career of this man who enjoyed a 100 per cent winning record from the three appearances he made for City against Burnley during this decade. Starting off at a lofty meadow, he moved on to a ground which ends with the letter x and his sole goal for his new club gave them one of the biggest surprise victories in the top flight of the decade. After a loan spell at a seat of learning, he went on a three venue tour of south Wales (Cardiff being his last stop) before arriving just over the border at a county town. His league career looked to be over after that, but he came back to turn out for the team that used to play at the Feethams and some red and white scamps. More non league football beckoned, but he played one more game in the Football League for one of the first sides Neil Warnock managed, before he came back to Wales to turn out for Merthyr, Inter Cardiff, Aberystwyth and Rhayader among others – who am I describing? 90s. Who is this future manager of Banbury United who played in a winning City team against Burnley during this decade? 00s. Can you identify this long serving (by today’s standards!) current manager from the following description? 10s. This international captain played twice for Burnley against us during this decade (both games were drawn) and scored a hat trick last weekend – who is he? far more effective centre half for them before being transferred to Portsmouth. with a letter t from the “head of television”. with Darlington, Lincoln and Scarborough before his return to south Wales. appearance for the club that day. Rangers’ 3-0 win at Motherwell last Sunday.